Changing perceptions of work, technology, and public space in San Francisco are revealed through historical advertisements for the city's cab industry. Pacific Taximeter Cab Company ad, San Francisco Blue Book, 1910 (archive.org). The taximetered, motorized cabriolet—or, if you’re American and in a hurry, the “taxicab”—was the combination of two inventions. First, the taximeter, which had been invented in the 1890s, but had only gradually been adopted by the world’s cab fleets; and second, the purpose-built motorcab, strong enough for an enclosed rear compartment (or convertible, as in the picture above). Passengers were protected from the elements by a windshield—which also, as it happened, recreated the separation of driver and passengers that had existed in horse-drawn carriages. (Windshields for the drivers came later). 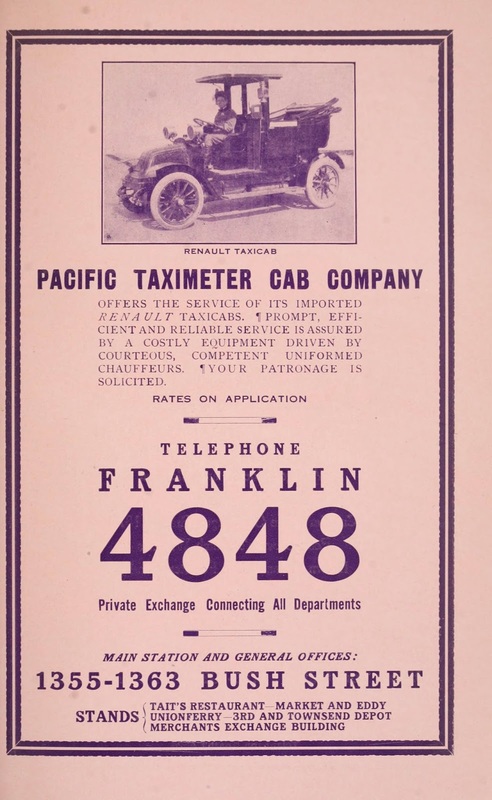 The first taxicabs to roll onto San Francisco streets in 1909 were operated by the Pacific Taximeter Company, though a slew of competitors followed within the year. Along with driving gloves and tall boots (for muddy streets), the driver in this 1910 ad sports the uniform and chauffeur’s hat which became the new standard “cabby” costume. Only the badge remained from hackdriver days. 1909 was also the year the Chauffeur’s Union (Teamsters Local 265) was founded. Strikes, along with intense competition, unforeseen costs, and insurance payouts, led to the demise of many of the early taxi companies, including Pacific Taximeter, which was absorbed by one of its competitors within a few years. The full-service garage was the automotive descendant of the livery stable: a taxicab company, car rental, parking garage, and repair shop rolled into one. 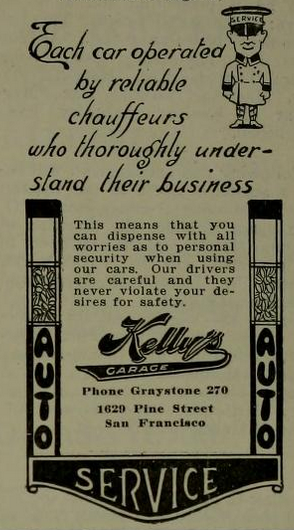 Kelly’s made the transition seamlessly, operating both autos and carriages through the turbulent Teens, and switching to fully automotive by the Twenties. This 1926 ad features a cartoon version of the uniformed chauffeur in full regalia, and manages to cast aspersions on drivers for other, newer cab companies, who, it implies, are more likely to drive recklessly. Founded in 1878, the business throve until 1936 when the Kelly family sold to the Gray Line. The old stable/garage was converted to offices, and stood until the 1990s when it was torn down to make way for the San Francisco Towers. Losing its role in everyday street travel, the horse-drawn carriage returned to its origins as a vehicle for pleasure rides and special occasions. The last old-time horse-cab drivers were independents after the tradition of John Glover. They could be found around Golden Gate Park into the late Twenties. 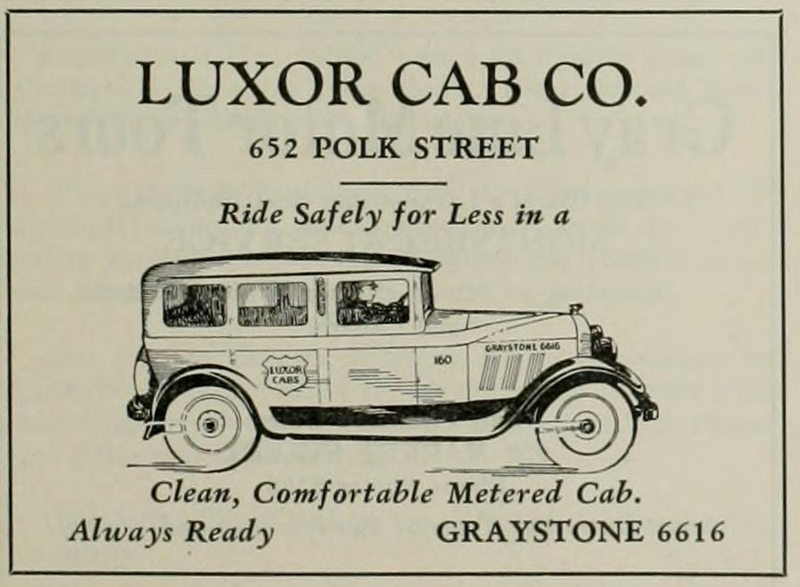 Ad for Luxor Cab, Douglas "20" Police Journal, 1928 (archive.org). The pattern for most of the Twentieth Century was set by the Twenties, by which time almost all the cab companies of the Teens had vanished, or had been absorbed by the Yellow-Checker conglomerate, which became the dominant company. But Yellow always had competitors. Founded in 1928, Luxor Cab is today the oldest continually operated cab company in the city, and at 87 years, has achieved greater longevity than any of the other cab companies, horse-drawn or motorized, which have ever operated in San Francisco. 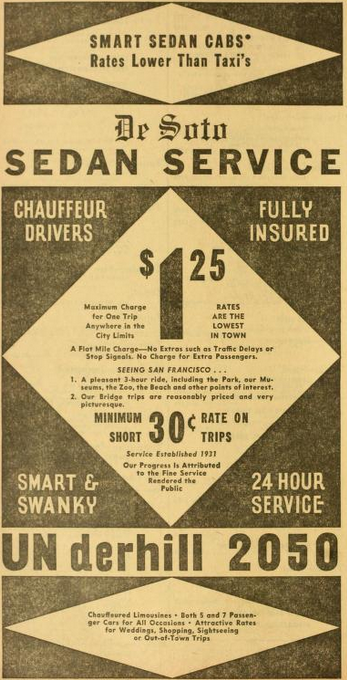 DeSoto Sedan Service ad, San Francisco Telephone Directory, 1938 (archive.org). The Great Depression brought new turmoil into the taxi trade as cabdriving became a back-up job for waves of unemployed workers. Car dealers, having trouble finding buyers, promoted cars as “job-creators”—buy a car and get an instant job, driving that car as your own taxicab! The result was a massive oversupply of cabs on the street, and a race to the bottom as desperate “wildcat” drivers competed for business by slashing prices lower and lower. The city responded by imposing minimum rates of fare, and prohibiting any new taxicab permits unless "public convenience and necessity” could be shown. This was the birth of the regulatory structure which (through various mutations) continues to this day. 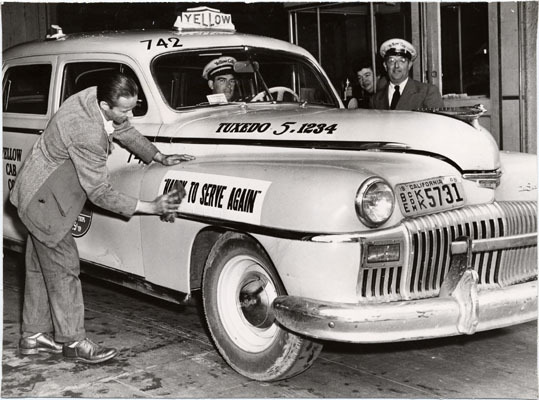 The imposed regulations did not so much squash the cut-rate cabs as squeeze them out sideways into the new category of “sedan service,” which was invented to circumvent taxi regulation by offering flat rates instead of using the taximeter. At "Rates Lower Than Taxis,” the flat-rate sedans multiplied: Olympic Sedan Service, Peacock Sedan Service, Eddie’s Sedan Service... but only DeSoto Sedan Service survived the decade. 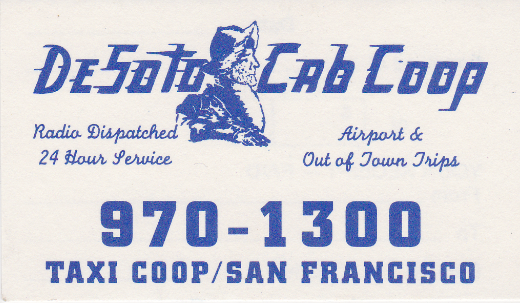 It was operated by San Francisco’s DeSoto dealership, which, ironically, had a contract to sell purpose-built DeSoto Skyview taxicabs exclusively to Yellow Cab. Which meant that if you called Yellow, you rode in a DeSoto, but if you called DeSoto, you rode in a Plymouth. Got it? Okay. By the 1960s, DeSoto had converted its “sedan service” into a regular taxi service, and the company had been sold to a group of drivers, who re-formed it as the DeSoto Cab Cooperative. Yellow Cab ad, San Francisco Municipal Record, 1964 (archive.org). An urban icon, the yellow cab owes its origin to Chicago cab magnate John D. Hertz (also of “Hertz Rent-a-Car” fame), whose Yellow Cab Manufacturing Company produced a line of purpose-built taxis in the 1920s. These yellow vehicles were distinct and popular enough that the cab companies around the country which bought them often named themselves after the vehicle; San Francisco got its “Yellow Cab” company in 1922. In the mid-20s businessman W. Lansing Rothschild consolidated most of the city’s cabs, including Yellows, into the Yellow-Checker company, popularly known as “Yellow Cab.” Yellow Cab went on to dominate the San Francisco cab industry for the next five decades. Yellow controlled all the best cabstands in the city, including the wharf, top hotels, and the airport. 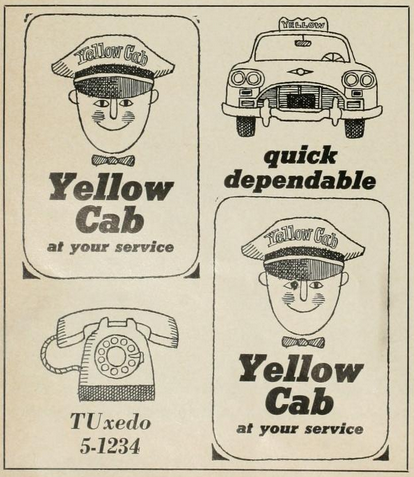 Seeking to lure customers, independent drivers painted their own cabs yellow, until the city put a stop to this by requiring the distinct “color schemes” by which San Francisco cab companies are still distinguished. As Yellow Cab of California, the company expanded its empire into other cities, including Oakland, Los Angeles, and Phoenix. Size proved to be Yellow’s undoing: acquired by the Westgate-California Corporation, Yellow fell prey to the spectacular collapse (due to embezzlement and mismanagement) of that corporation. Yellow went out of business in 1976, putting over a thousand cabdrivers out of work and idling almost half of the city's cabs. After a year of disorder, medallion-holding drivers formed the Yellow Cab Cooperative, which remains the city’s largest licensed cab company. 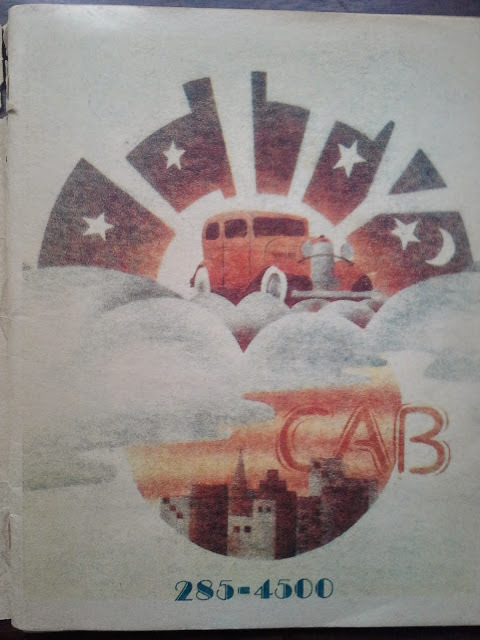 City Cab advertisement, The New Deep City Press, 1976 (courtesy of Alan Freberg). As epicenter of the counter-culture, San Francisco attracted generations of artists, individualists, rebels, and dreamers. More than a few ended up driving cabs. Beat poets of the Fifties, Diggers of the Sixties, and bohemians of every decade found inspiration behind the wheels of San Francisco taxicabs, lured by the independence and freedom—even the danger—of the job, and above all, by the city it allowed them to explore. Evocative of San Francisco’s tradition of psychedelic poster art, this City Cab ad appeared in a 1976 issue of the New Deep City Press, a magazine of poetry, art, fiction, and political commentary, written and produced primarily by drivers for City Cab. Repeating features included the Maxie the Taxi comic, and a series on how to play craps by cabdriver Jimmy the Glove. The division between driver and passenger—in the form of the partition between front and back seats, and marked by the driver’s formal uniform—eroded over the course of the century, as what had once been markers of respectability came to be perceived, instead, as uncomfortable tokens of class inequality. The partition became rare in the 50s; by the 60s, drivers were starting to wear everyday streetclothes instead of uniforms or suits. The chauffeur’s cap hung on as a symbol (a cabdriver makes it part of a Sergeant-Pepper-ish look in 1969’s “Yellow Cab Event”), but has rarely been seen since the 80s. Once again, only the badge remained. The late 1970s saw the breaking of the Chauffeur’s Union, and a loss of status for the occupation, as drivers went from being “employees” (with benefits such as healthcare, pension, and paid vacations) to “independent contractors” (with squat). This went in hand with broader trends in the 70s and 80s: the flight of industrial jobs from the city, and the erosion of union influence. Changing technology disrupted San Francisco’s cab industry—again and again. Radio dispatch was introduced in the Forties; computerized dispatch in the late Eighties; and over the last decade, improved GPS-based computerized dispatch, and smartphone e-hailing. Each new technology transformed the way cabs and passengers moved through, and interacted with, the city. By the 1990s, when this DeSoto Cab receipt, complete with Conquistador-as-cabdriver (unshaven, arm slouched on the driver’s window, but still dressed for conquest), advertised “Radio Dispatched 24 Hour Service,” the taxi radio had become a part of the cab’s iconic image. To ride in a cab was to hear the rapid-fire dispatcher (“he sounds like an auctioneer!”); to drive one was to learn to listen, interpret, imagine, and contest the city through the stream of street names, addresses, cab numbers, and random commentary flowing from the radio. Any kind of technological change involves a trade-off, a shifting around of cost, convenience, knowledge, and relations of dependency. Changes in taxi dispatch—first computerization, then e-hailing—have increasingly restricted the flow of information to drivers, and so decreased the reliance on interpretive and navigational skills developed by drivers through experience. In early 2015, DeSoto rebranded itself as Flywheel Taxi, taking the name of a prominent e-hailing app. Not unlike the old Telephone Cab and Carriage Company, the name invokes the novelty and appeal of the newest dispatch tech. Yet the rebranding of “DeSoto” to “Flywheel” implies something else as well: a changing image for the San Francisco cabdriver. The legendary explorer, forever searching for the Fountain of Youth, has been replaced with a “flywheel”—literally, a cog in a machine. 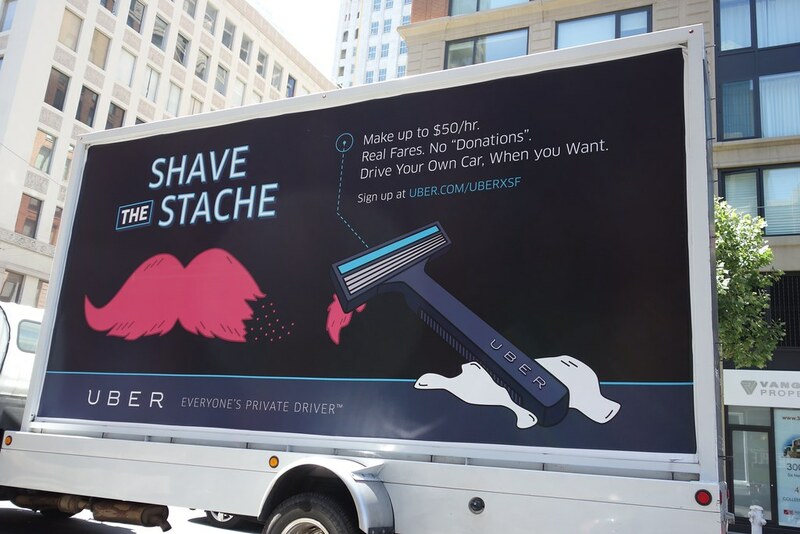 "Uber targets Lyft," photo by Steve Rhodes, 2013 (Creative Commons). The Great Recession brought turmoil into the cab industry as waves of the unemployed and underemployed sought to make ends meet by driving for hire. They were helped along by smartphone e-hailing companies, which, taking a cue from the old “sedan services” of the Thirties, branded themselves as “ridesharing” instead of as “taxicabs” to avoid regulation. Cheap and convenient, paid “ridesharing” car services swiftly became popular—in 2014 there were six such companies operating in San Francisco—and thousands of ridesharing cars roamed the streets, swamping the number of licensed cabs. Freed from the constraints of the city’s taxi regulations, ridesharing companies recreated the cycles of earlier cab history. Unlimited numbers of vehicles plying for hire led to price wars (at lower than Depression rates); lack of commercial insurance led to legal debates over liability. In an echo of the Thirties, buying a car was promoted as a form of job creation, and one major ridesharing company offered vehicle financing to prospective drivers (though claims of predatory lending ensued). With the development of “horse-hiring” (leasing cars to drivers for a set time and fee)—a practice which, as the name suggests, goes back to livery stable days—little remained to distinguish rideshare drivers from taxi drivers (except, of course, that the latter still wear badges). SFMTA bus ad, 2014. Courtesy of San Francisco Citizen. Competing trends of regulation and deregulation face off in the 21st Century. For San Francisco’s cab system, this means a contest between the city’s Municipal Transit Authority (MTA), which governs licensed taxicabs, and corporations like Uber, Lyft, and Sidecar (which, though headquartered in San Francisco, are incorporated in Delaware). At stake is not just the movements of cabs, drivers, and passengers, but the data they create as they are increasingly tracked by mobile, interconnected devices. The debate over cab regulation today is just a precursor to future conflicts over who will control the technology and information used to move cities in the coming century. The public image of drivers for hire is up for grabs. Rideshare services ask riders to think of their drivers, not as “cabdrivers,” but as either “private drivers” or as “friends with cars;” “Hail a Fellow Human, Not a Taxi” read one rideshare-promoting headline, revealing a new (sub-"human") low in the cultural image of the cabdriver. “Do you know what you’re getting into?” responded city regulators, using this 2013 bus ad to cast suspicion back at the less-regulated “rideshare” services. Caught in the middle are the drivers. Since the 1970s, drivers for traditional cab companies have been treated as independent contractors, with few workplace protections, no benefits, and no job security. The growth of corporate “ridesharing” services like Uber and Lyft represent a further intensification of this trend towards precarious work. Drivers have begun to organize in return: rideshare drivers have held strikes and protests to bring attention to their precarious working conditions; San Francisco’s licensed cabdrivers have formed a local branch of the AFL-CIO-affiliated National Taxi Workers Alliance, in the most significant instance of labor organizing in the San Francisco cab industry since the downfall of the old Chauffeurs’ Union forty years earlier. The trouble with reading history from advertisements is that they tend to paint a rosier, more simplistic picture than what really exists; a deeper understanding has to be filled in from the gaps and silences that haunt the edges of the advertised image. Today we live in a world more saturated with a marketing perspective, and with the distorted view that it feeds us, than ever before. Yet, whatever the future holds, it depends on the choices we make, collectively, today. What sort of city do we want to live in? How do we want workers to be treated? And what relationship do we want to see between technology and its users? Hopefully, a little historical perspective can help us see past the myopia of the present. Once again, This is an ongoing project -- any and all comments, criticisms, corrections, questions, or contributions are welcome!